Ike's also have a silver version and the clad version. The silver is 40% silver clad which the circulation versions are the same clad composition as the clad Washington quarter. While a beginner can fill out an Eisenhower collection quickly and with few expenses, getting high grade circulation grade Ikes can be more challenging giving a beginner room to grow. 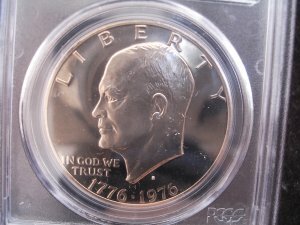 Higher grade 1971 Ike's are not easy to uncover for good prices. So a Eisenhower Collector needs to keep his eye out for this dates in MS66 or higher. As of this writing, PSGC has only graded 21 '71 Ikes at MS66 Between the poor strikes and the large number of scratches in these coins from the bagging process, there are few high quality examples. The design of the Eisenhower dollar has perhaps the most lifelike protrait of any US Coin design on the obverse, as created by Frank Gasparro. 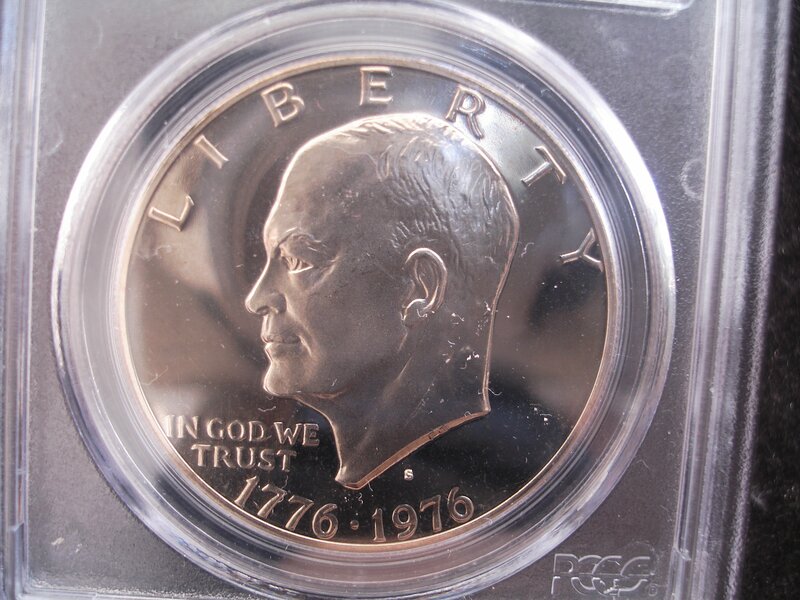 In proof these coins leap at the viewer with the likeness of Eisenhower almost floating on deep cameo fields. Details including the folds in the neck skin finish off the image in perfect detail. The reverse was designed by Michael Collins and James Cooper. 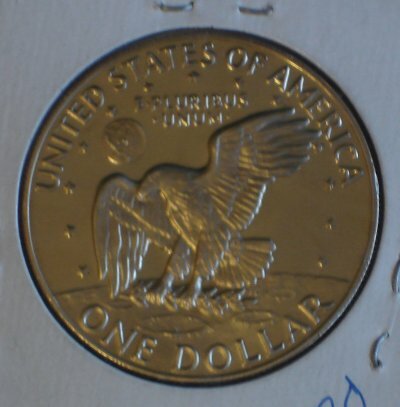 The only coin to have a view of the Earth from the Moon celebrated the Apollo Moon shots of the 1970's. This made the coin an instant success with every 5 year old child of the time, including yourself truly. 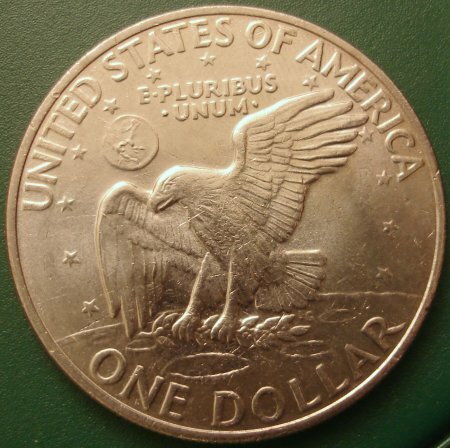 In fact, the reverse design of an eagle perched on the Moon outlived the Eisenhower itself when it was adopted by the Susan B Anthony dollar which was to follow. The Basic Type ran from 1971 until 1974. 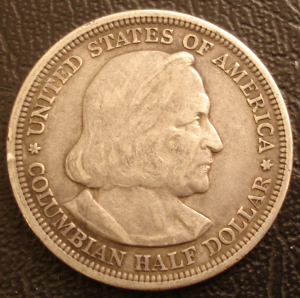 In 1975 and 1976, the bicentential Dollar, Half and Quarter was released. 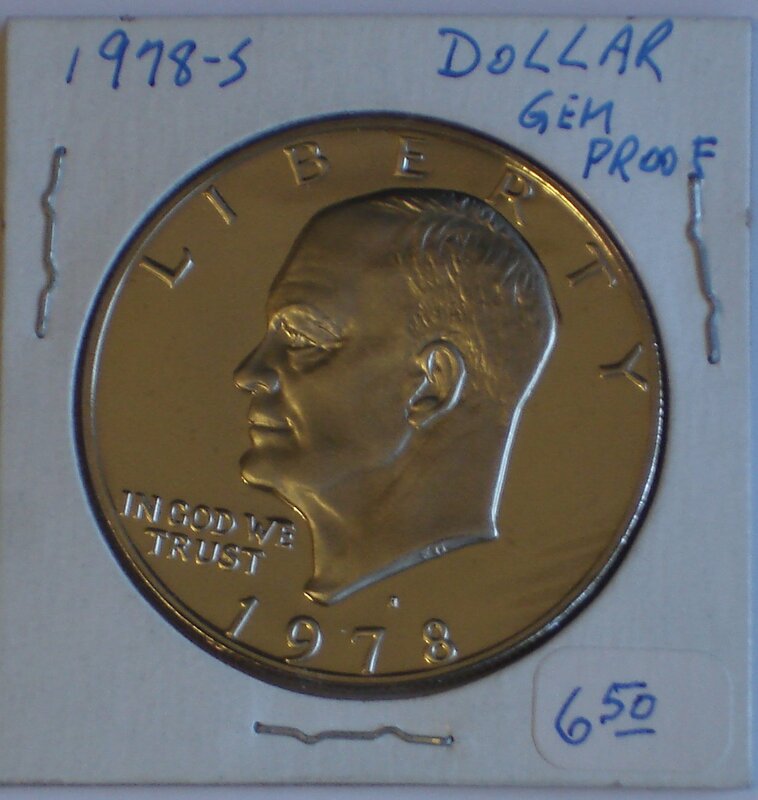 The 1973's were origianlly only available in mint or proof sets. The Silver sets were minted in San Fransico at mint coins and as proofs. 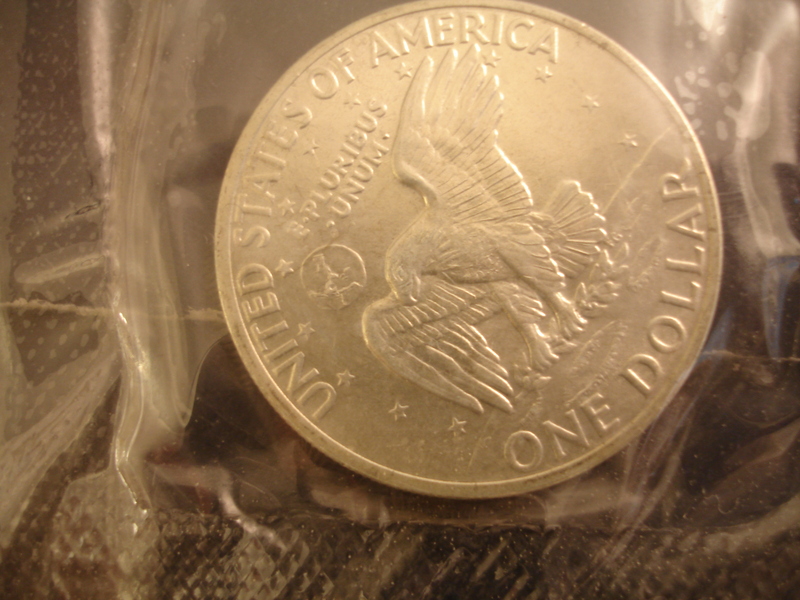 there are rare D silver coins as well, which are considered errors. 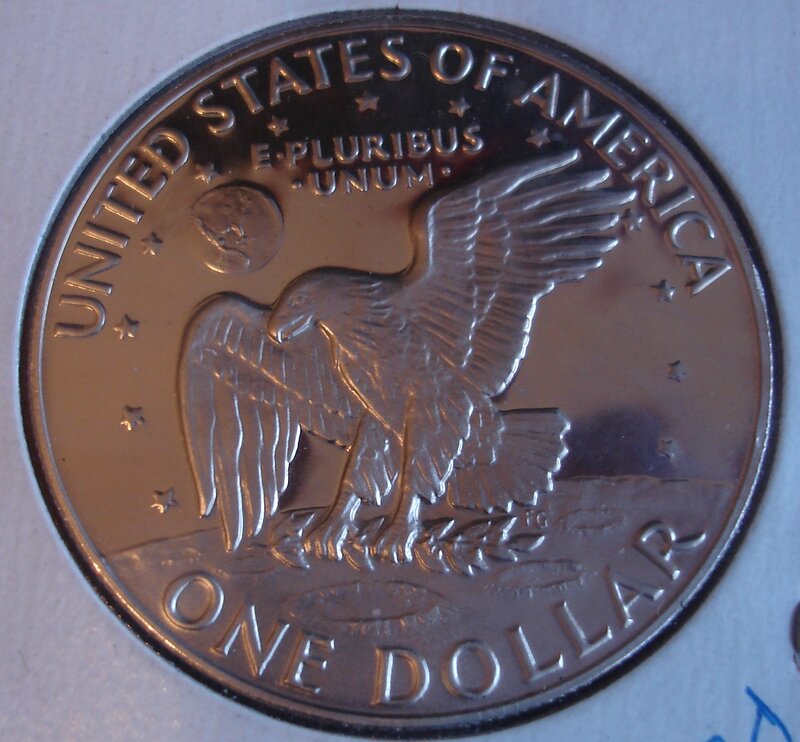 The eagle on the Eisenhower Dollar was reworked from the original design. 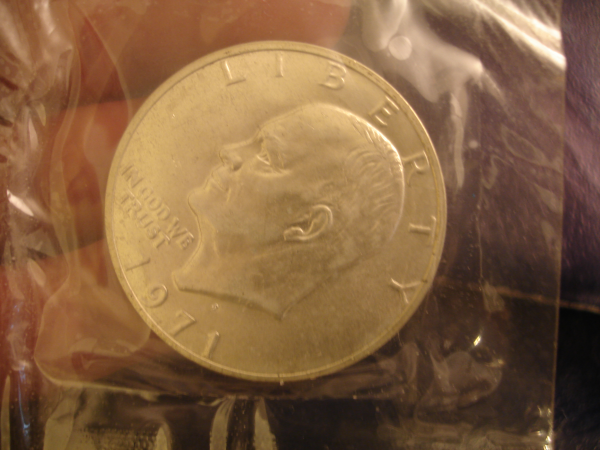 By the 1970's it seems that even our coinage was swepted into the politics of the Cold War. It was decided that the eagle needed to be a friendly face to the nations of the world. It was decided to have this "Disneyed" version of the eagle, wing stretch up and foundly waving at the onlooking public. 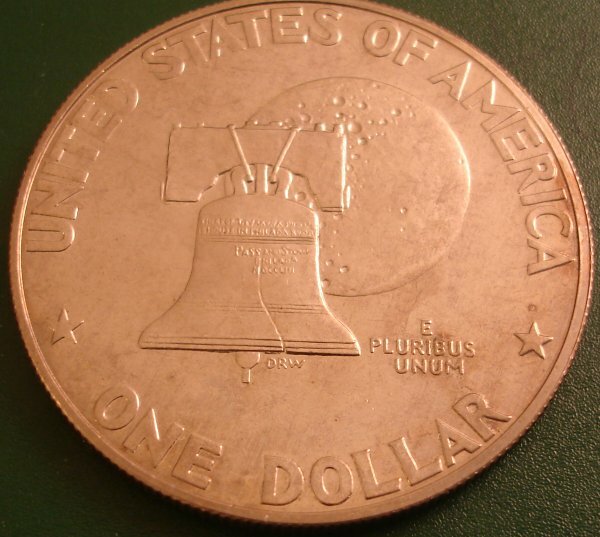 This the Bicentential in 1976, the 1975, 1976 and 1977 coins were all of the Bicentential coin type with the Liberty Bell and the Moon on the reverse. 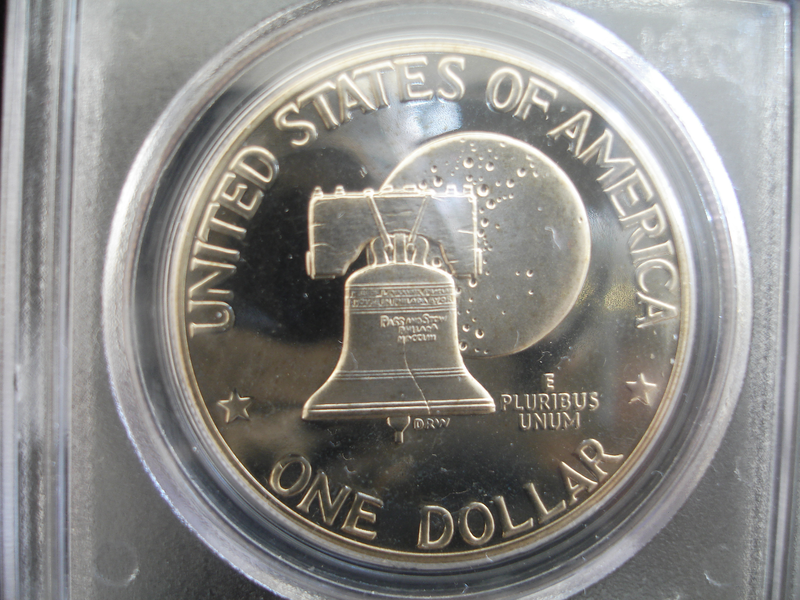 This is similar to the Liberty Bell on the Franklin Half Dollars, but clearer. It makes for a very nice reverse. 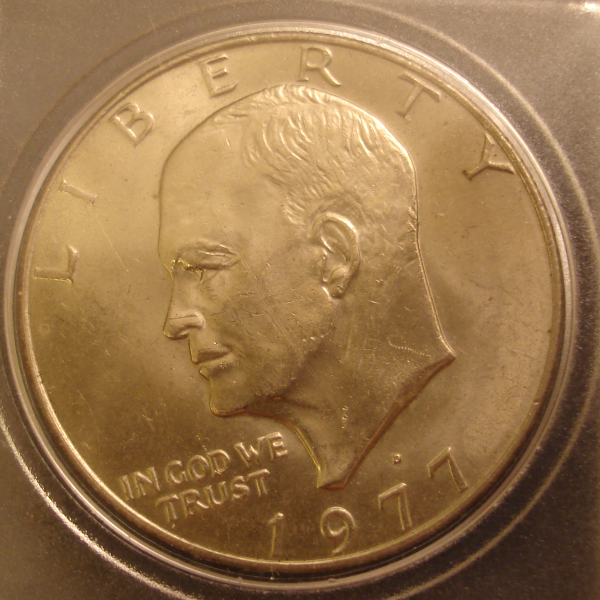 This example is a Clab Eisenhower. The Clad proofs can shine very nicely when they come from the mint. The 1978 proofs are commonly very reflective. Its hard to photograph such detail but in ths movie of this 1976 Eisenhower you can see the ceiling fan spinning in the mirror like fields. The fan is 8 feet from the coin. 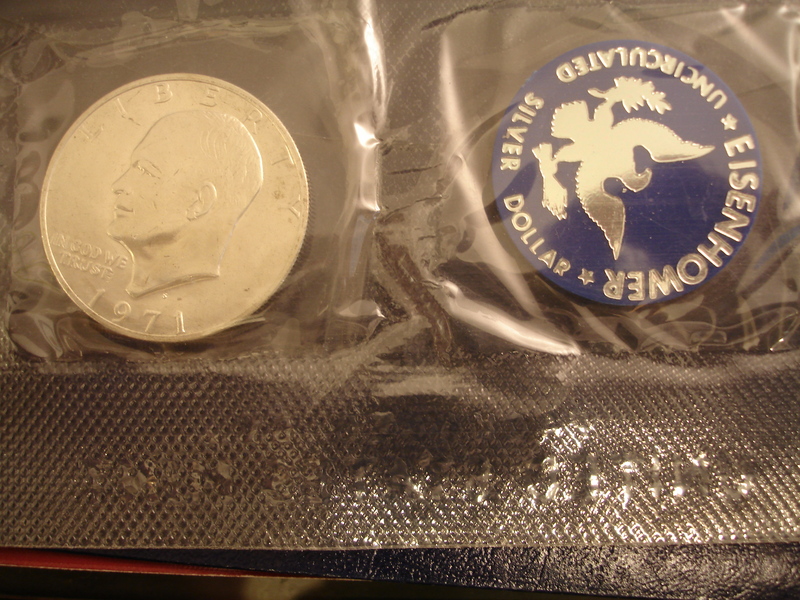 Eisenhower Dollars were distributed as 40% silver coins available from the minti in special packaging from 1971 through the bicentenial. 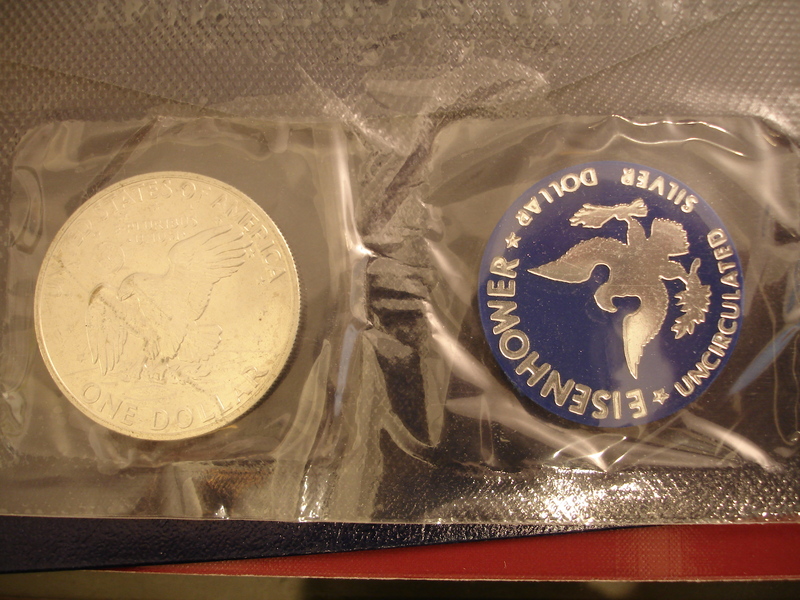 Struck both as proof and as uncirculated coins, they were origianlly sold in plastic wrap. Here are examples of 1971 uncirculated sets. Click on the images for a full size view of the complete packaging. 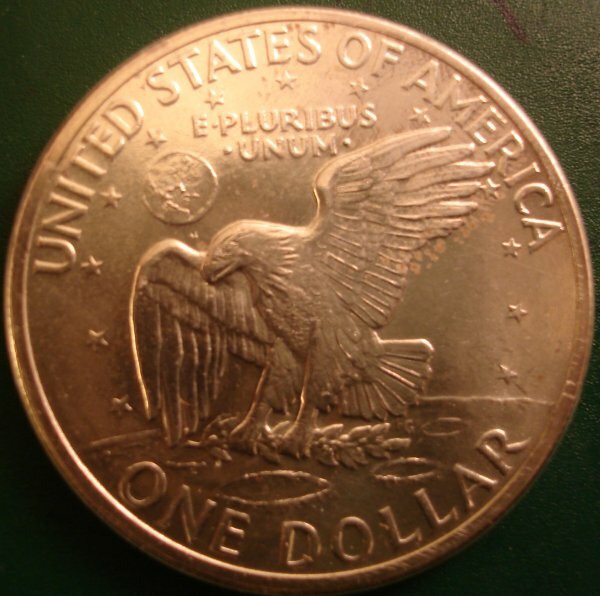 view of earth which determines several sub-types of Eisenhower coins. GDJMSP nailed the proof sets and current mint sets. The older mint sets have a great deal of diversity from date to date and from coin to coin. Almost all of the finest coins made in the last couple of generations went into the mint sets. Those which didn't go in the mint sets almost always went into circulation and became lost or worn. 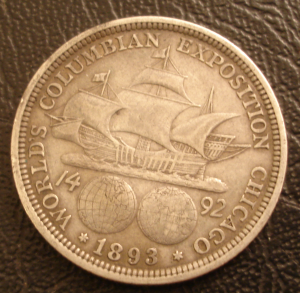 In some cases there are virtually no examples of a coin that didn't come from a mint set. Perhaps the finest made of the mint set clads would be the 1972-D quarter. 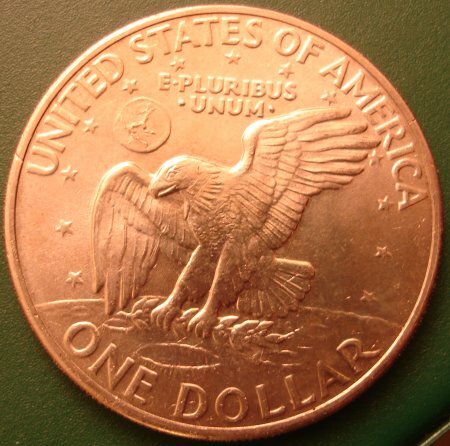 This coin would average MS-64 with 25% going MS-65 or better. Even MS-67's for this date are not rare. The best made of the cents in sets might be the '88-D. This would average MS-66 and very highly PL MS-69's are rarely available. 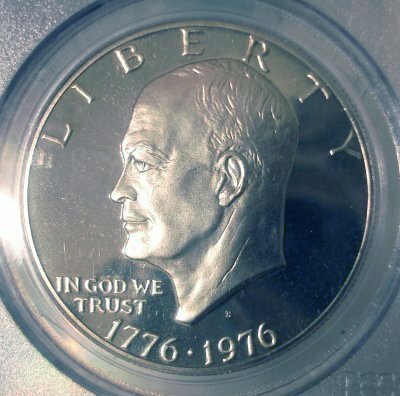 The worst made mint set coin is, hands down, the '76-P type I Ike in the '75 mint set. Fully half of these can't even be sold as BU since they are so ugly. Just finding a nice attractive MS-63 can be a chore. Gems are rare. 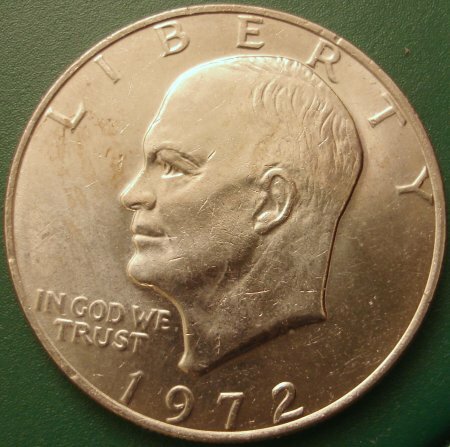 Not too far behind it would be a 1969-P quarter. This coin is horrid in the sets and while MS-63's aren't too tough gems are highly elusive. When this set was made perhaps 1 coin in 300 would go gem but the years have not been kind to this set. Large percentages of them have tarnished and there are a few people who selectively seek this coin. Of course it's hard to impact the population of something you can't find. 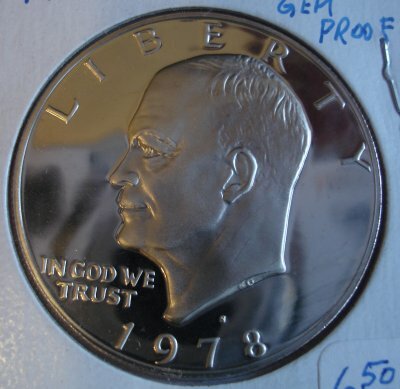 The problem is exascerbated by the fact that a large percentage of this date has been destroyed over the years because of its limited value and the silver run-up that made it profitable to destroy them for the single 40% silver half in them. These are the extremes. In between there is almost everything. As a rule if one coin in a set tends nice then they all do but there are numerous exceptions. There is a lot of variability between the mints too. Denver is usually much nicer but if you look at only the very finest coins than the Phillys tend to be better. In 1986 the mint started polishing or burnishing some of the mint set planchets. When these were struck by a new pair of dies some spectacular coins were made but they were usually covered in small scratches that make them quite unsightly. A lot of the pennys are just a lost cause now. For instance every single 1968 cent from mint sets has carbon spots now. The vast majority are just ugly because of this spotting. (~95%) God only knows what collectors are going to do for gems of this date. Some roll coins are OK but these are hard to find with good strikes. The '84-D is rapidly going the same way. Most of these were pretty ugly to start with because of bad surfaces resulting from plating problems and striking characteristics so it's not as big of loss but roll coins of this date are tough and also suffer from the same problems. The late '70's cents from sets are hard to find without lots of scratches. I usually figure that two mint sets out of three will have at least one nice coin and this works well as a rule of thumb. 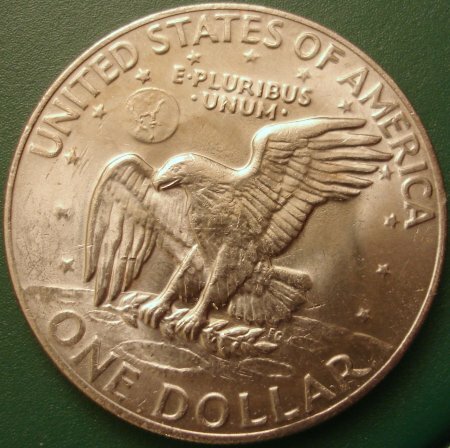 Typically the nice coin will be something that is expected like an MS-64 cent or dime but it could be a choice gem '76 type I dollar. Before 1980 you can find a surprising number of sets that contain all gem coins. I suspect that this was the year they went to automated equipment for filling these sets. 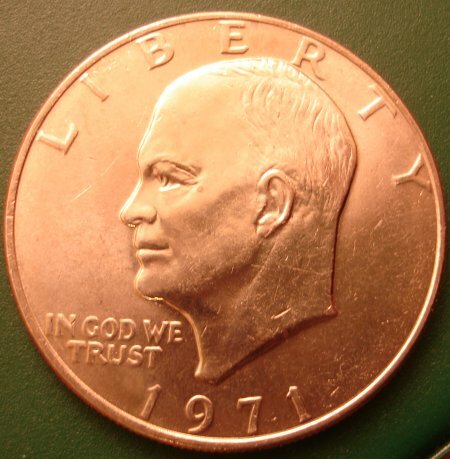 Oh course, one as of this date (August of 2007) can still find Eisenhower Dollars occasionally in ciruclation. These can be of suprisingly good condition since they circulated so minimally. This is one of my favorite example, a 1977 D that I pulled from a cash register in one of the Pharmacies that I've worked at over the years. 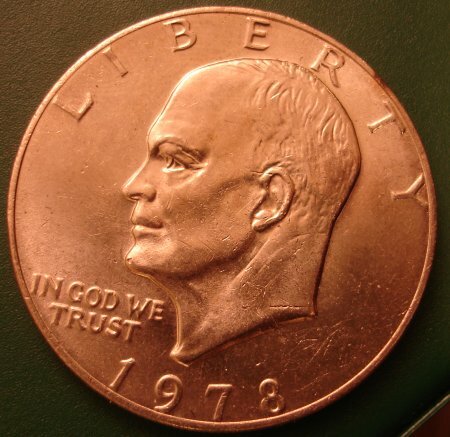 It's a fine strike of a 1977 Ike. In 1969, with the passing of World War II hero and former President Dwight Eisenhower, and with the advent of the Apollo Moon shot, the US Congress was looking for a memorial of both events. 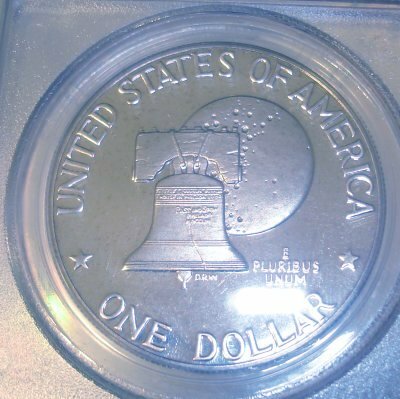 The US mint hadn't minted any Large dollars since the failed 1964 mint run of Peace Dollars that were all melted. And over the next 5 years, silver dollars were becoming rarer. This was particularly problematic for the Las Vegas Gambling Casinos and gaming industry. 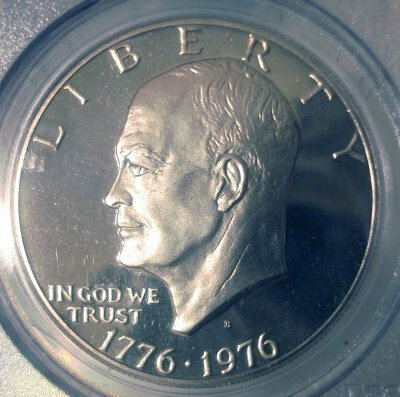 By October of 1969 Congress was prepared to allow the US Mint to release a new dollar with both Eisenhower and the Apollo XI memorial being prepresented and Bills were introduced to do so. The final bill wasn't passed by Congress until the end of 1970. 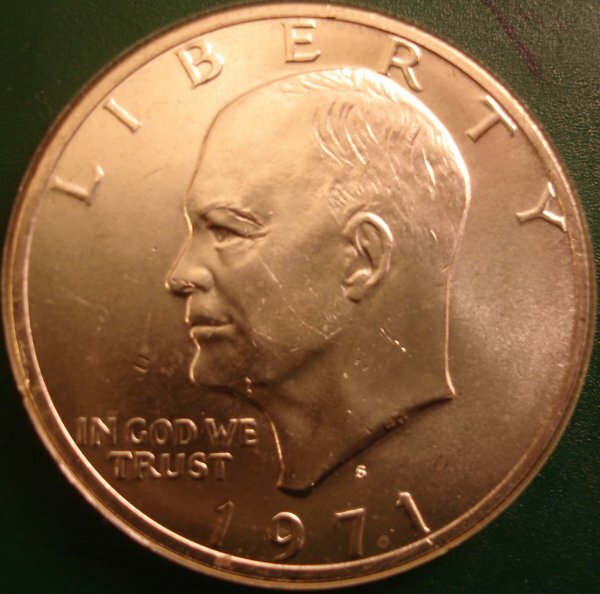 The mint wasn't left much time to get the Eisenhower dollars designed or produced. But there were a lot of problems to overcome. First, in 1965 the US government converted most coinage to Copper and Nickle clad coins because the costs of silver pushed the metal past the point of being economically viable for coinage use. With the dime, and quarter converted to clad by 1965 there was little reason for the dollar size coin to be full cartwheel sized other than the needs of the gaming industry. Little experimentation was done with clad coins of this size and the results weren't always asthetic. Particularly, the circulating Eisenhower's showed clanks and marks very easier and the ability to mint these coins with the correct pressure was something the mint had to learn by doing. 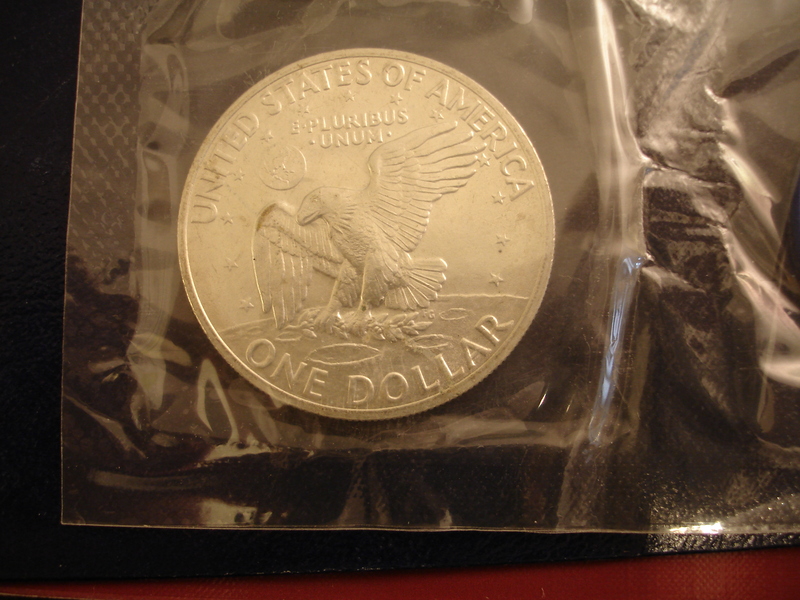 Additionally, many proof an mint examples were made with a 40% silver composit similar to the Kenedy half dollars. Although Mint Chief Engraver Frank Gasparro had some start time in developing concepts for the new coin, the mint was still in a hurry to bring the Ikes to the public. The normal public requests and design competitions were dispensed with and Gasparro himself brought the design to fruition. the process itself, however, seemed to be a bit haphazzard, and the mint seemed to be learning on the job meaning that several subtle design changes were made to the coins as they got closer to production and through out the production run. For coin collectors, this means that today we have several varieties to collect and new ones seem to be identified as time goes on. 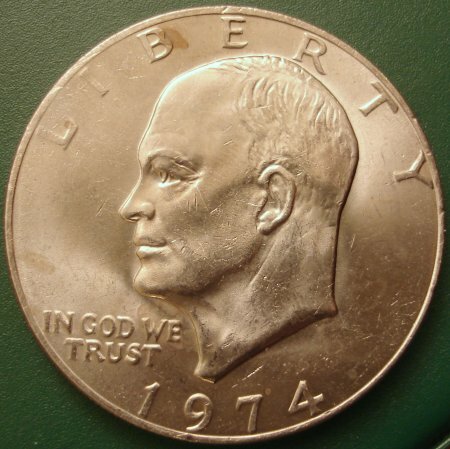 The familiar basic design includes a rather impressive portrait of Dwight Eisenhower on face of the coin and the reverse had a derivation of the Apollo Mission Emblem. America was all but space crazy at this time with the rousing success of the Apollo moon walks and people immediately identified the familiar NASA iconography of the Eisenhower reverse. 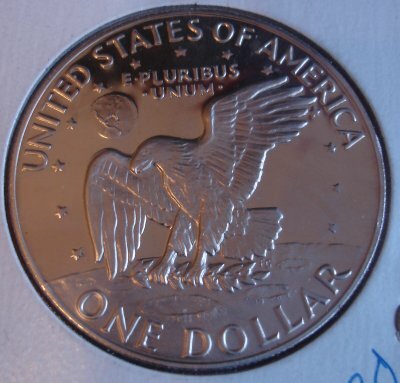 The unusual reverse perspective of the Eagle on the moon looking out towards earth mimicked many of the new photographs and television images that had been plasted on newspapers worldwide the summer before. See the luster and reflectivity in the small movie. 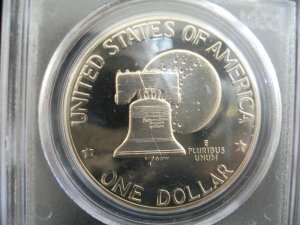 The coins finnaly started rolling off the presses on November 1st, 1971 and as usually many were scooped up and saved for their novelty and collectability. 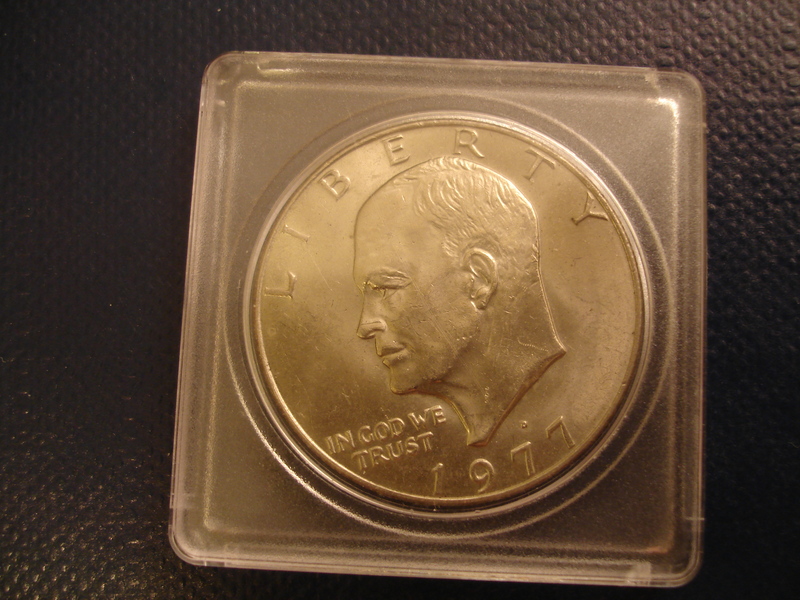 Aside from the circulating examples, the mint also sold the authorized silver clad designs in proof and in circulating packages. The uncirculated silvers are affectionately known as Blue Ikes for the color of the plasitc tokens and envelopes they were sold. The silver proofs were know as Brown Ikes because of the box they came in. 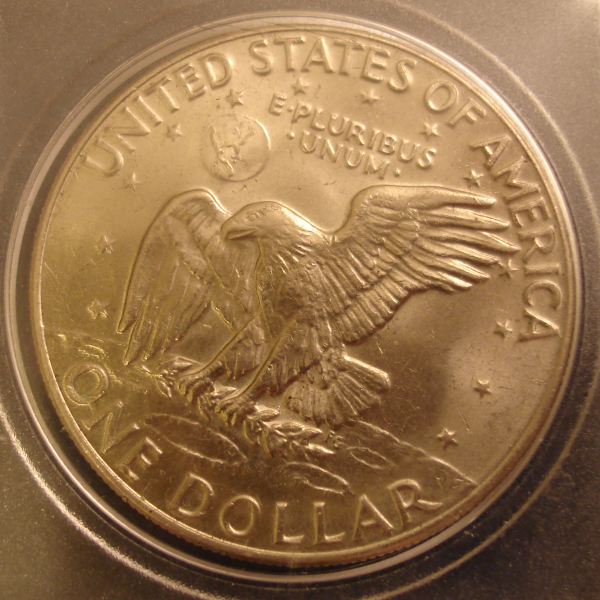 Between the Silver and the Clads, the proofs and the circulating strikes, and added to this that in 1973 only to mint more circulating coins in 1974 the mint also sold clad proofs in the proof sets and the seperate silver proofs, and then starting in 1975 through 1977 there were bicentenial versions of the coin, both silver and clad, the Ike mintage is one of the most diversified, if not confusing of any coinage the United States ever created. 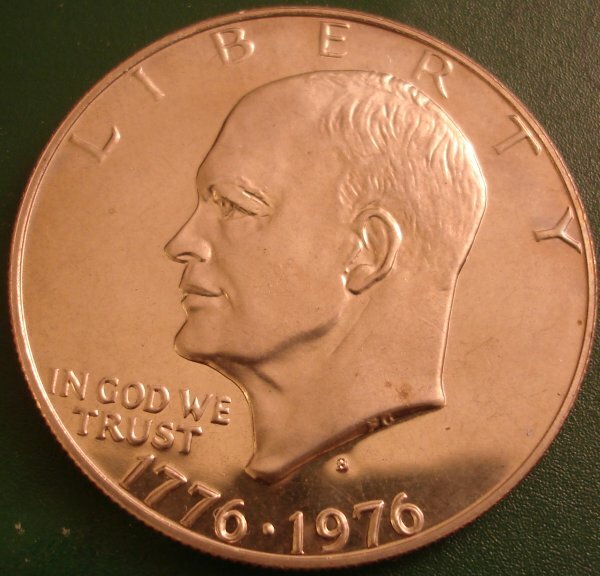 And to make matters further complicated, by 1973 it became aparent that the public had no interest in using for comerce or savings a big nickel alloy coin, and so circulating versions weren't produced in 1973 or 1974. All non-proof versions of these years came from mint sets. 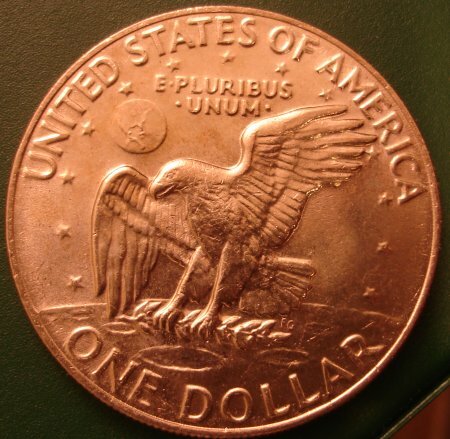 By 1979 the coin was replaced by the new small sized dollar coin that we have today. 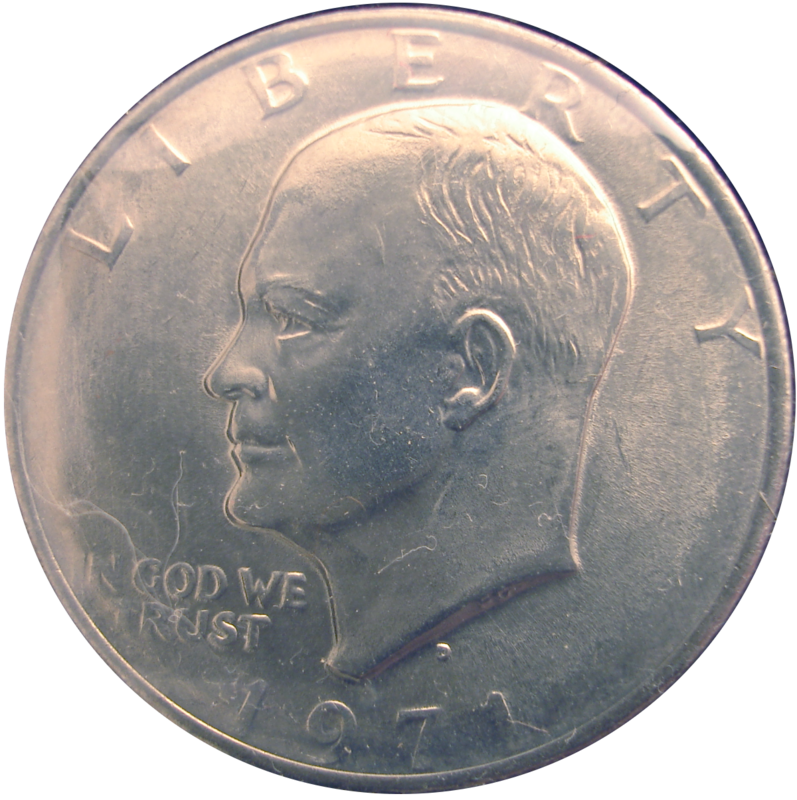 The initial minting of the Eisenhower Dollar breaks down to 3 basic groups and several varieties within these groups. 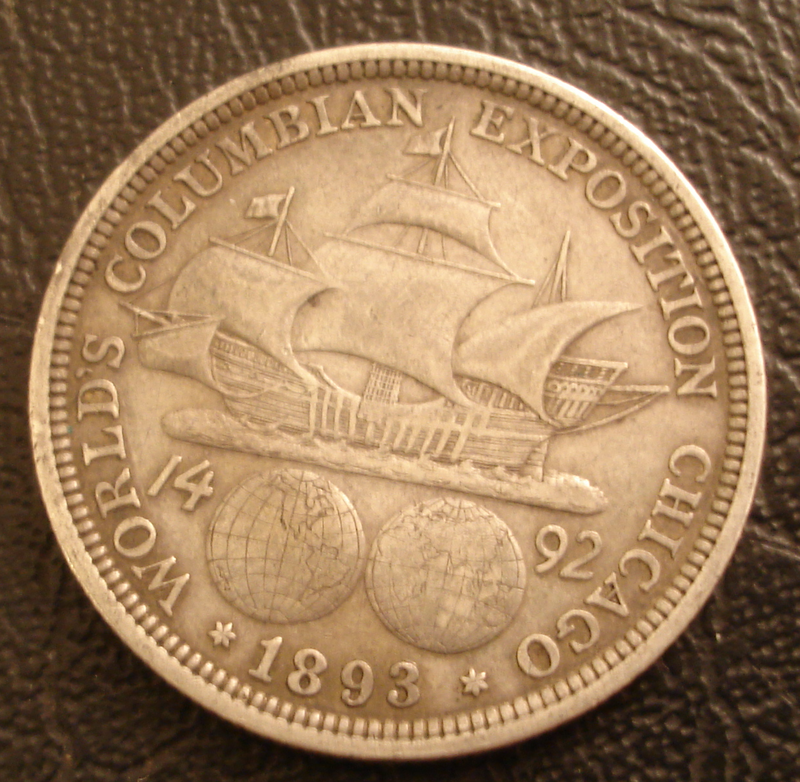 The mint distributed a clad circulating version from Philedelphia and Denver and the Silver versions from San Fransico. The Philedelphia mintage was 47,799,000 coins and the Denver mintage was 68,587,424 coins. The odd number is not explained. San Fransico produced a shade less than 7 million silver uncirculated coins and about 4.26 million proofs. One of the major charactoristics of the 1971 run was that the mint had to make minor alterations of the design for smooth production. 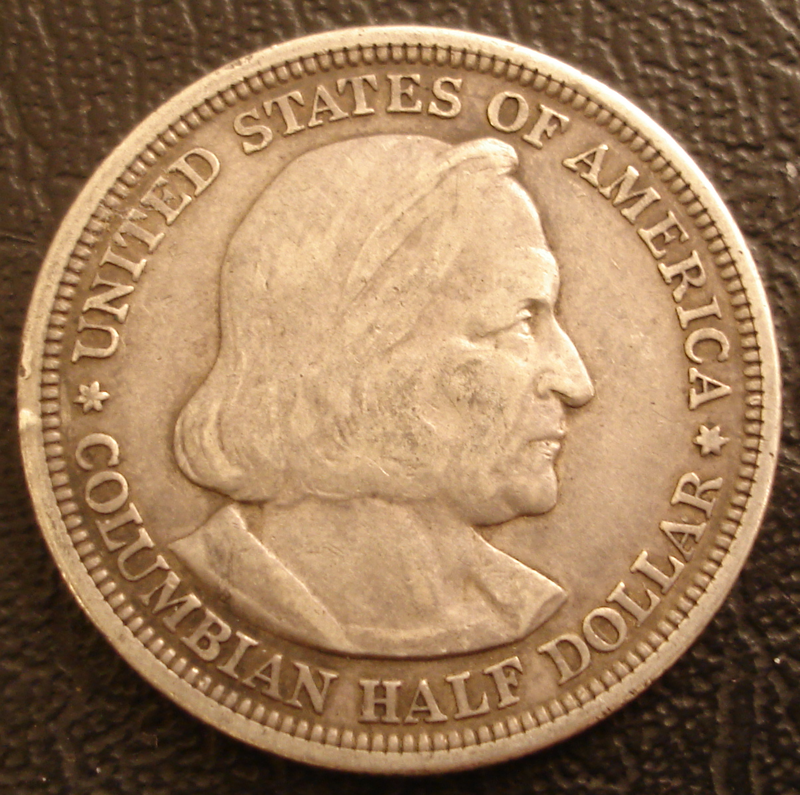 This resulted in at least one major variety out of Denver called the Friendly Eagle Variety (FEV), many of which were actually struck on proof planchets which were excess from the west coast proof production. 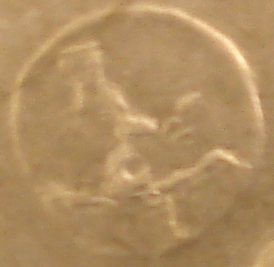 According to the research done by the Ike Group, it seems that the FEV variety was likely the first design intended for the standard strikes for all the clad Ikes and the silver uncirculated strikes. But after testing in Philedelphia, it was modified because of production problems. The Denver mint, however, started early, likely with spare older single chamber presses that most normally would be used for gold coinage production. To my knowledge, there was no standard gold coin production at the time so you can only imagine how anxious Denver must have been about the new cartwheel dollars and getting the coins to Las Vegas if they push these presses into action. 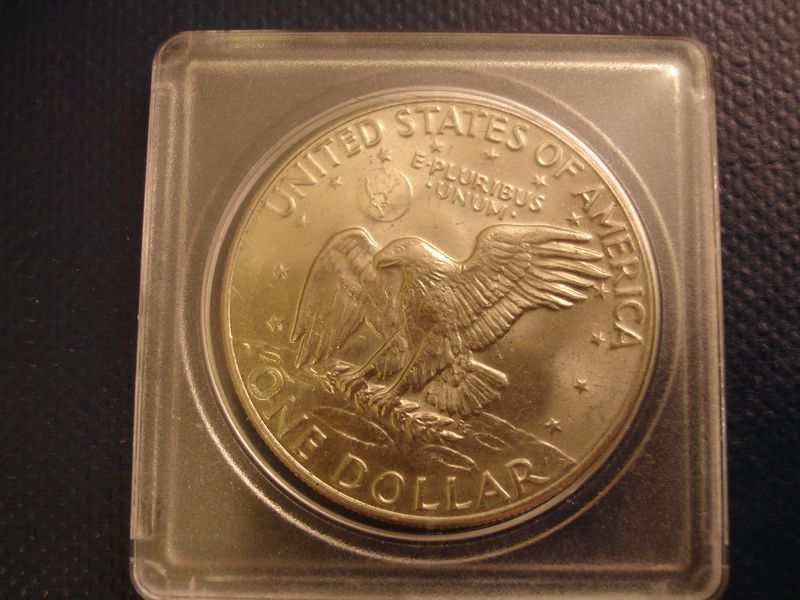 With only the original FEV design available, they produced perhaps 500,000 1971-D FEVs and about 10% of those seem to be minted on proof planchets that were extras from the San Fransico Mint. There has also been a debate as to whether this Friendly Eagle Variety is a Variety or a pattern. The consensus is that it is a varity but you may find in the literature the coin refered to as FEP as well as FEV. Articles on the variety have been written in the coin press including July 2007 issue of NUMISMATIST. The FEV can be difficult to spot for the beginner and you need a very decent picture and a good loupe to spot the coin. Generally, the design is completely different than the standard low relief coinage. But this is in no way obvious to the causual observer. So there is a good list of differences that one can spot to identify the variety. 1. The Earth is round. 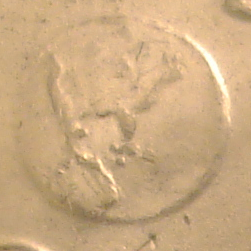 Standard 1971 Ikes have a definite flatening in the earth on the left upper quadrant of the coin. 2. The Gulf of Mexico is spaced out between Florida and Mexico, and has a rounder shape. In fact, Florida comes down out of North America in a more vertical angle than a standard 1971 IKE. 3. The Caribian Islands are chained together in a line, with one Island below the chain while on a standard IKE they look like 3 islands in a triangular configuration. 4. Florida, as mentioned above, is at a right angle to North America, pointing straight south. 6. There is a missing brow line in the Eagles head giving it a more friendly look. 7. The Eagles chest feathers are more regular and not flared. 8. The tail feathers have a subtle difference. The top two feathers have are missing an extra line of seperation that was added to the standard design. 9. The Crater under the claws has 2 extra flow lines between the N and the E in “ONE”. 10. The easiest to identify difference, in my opinion, is that in the FEV the top of first “L” in DOLLAR on the reverse is craddled between two flow lines. 11. Finally, I've never seen this, but the Ike Group documents that on high magnification there is an iconic representation of the Apollo reentry vehical near the left side of the earth that looks like 2 lines joined together like an arrow.